I’ve got a quick, easy, super healthy and flavorful meal to share with you this week! A lot of people tell me that they wish they ate more fish but they just don’t know how to prepare it or what kinds to look for. Fish seems to be the most intimidating protein in the kitchen but it shouldn’t be. It’s not any harder to prepare than chicken and it can be a lot more nutritious! In past posts, we’ve talked about what to look for when buying fish, what type and how to prepare salmon (even if you’re not a fan–yet! ), and whether or not tilapia is a healthy choice. I’ve also shared some great recipes for steelhead trout, fish tacos and more. 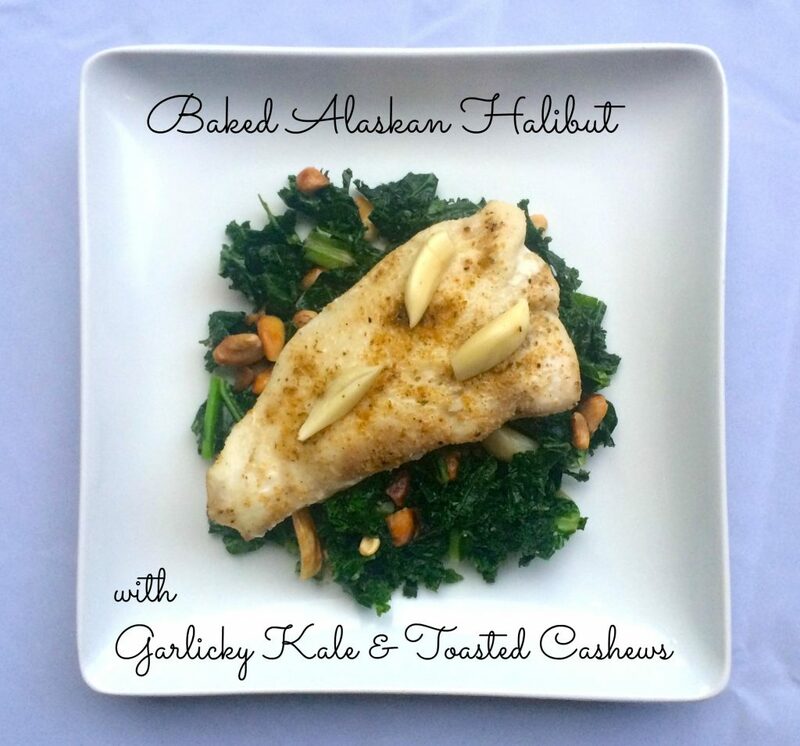 This week, we’re talking halibut. 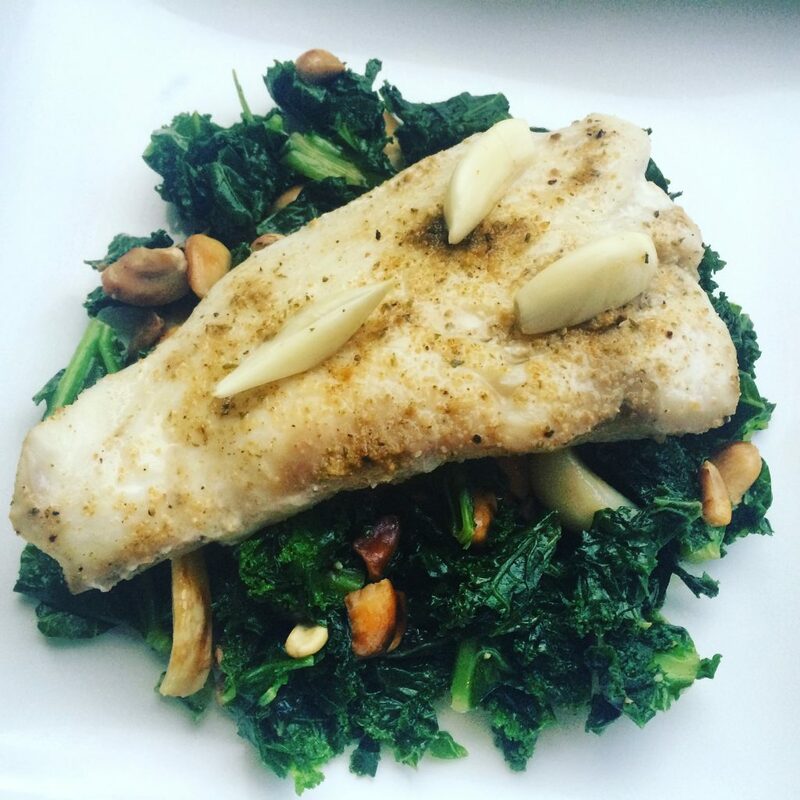 Halibut is a lean, firm and flaky white fish with a mild texture. Wild-caught Pacific halibut is considered Certified Sustainable Seafood. Halibut can easily dry out because of it’s super low fat content. Cooking it in foil packets like for I did for this recipe helps to lock the moisture in. Toast the cashews in a medium sized pan on medium heat. Continue to toss until well toasted. Remove from the pan and set aside. Add the olive oil to the pan and heat through. Add the garlic cloves and sautee for 1-2 minutes. Add kale in small batches (will cook down) and add the cashews back in once all kale is wilted. Remove from heat. For the halibut, first make sure it is completely thawed if previously frozen. Rinse with water and pat dry with paper towels. Cut into 4 ounce portions and preheat the oven to 375 degrees. Lay out aluminum foil and spray with olive oil. Lay fish on top of sprayed foil and season as desired. Flip the fish and season the opposite site. Top with garlic cloves. You could also use any citrus fruit. Fold the foil to enclose the fish and create a packet. Bake for 12-15 minutes on 375 degrees. Fish is done when easily flakes with a fork. 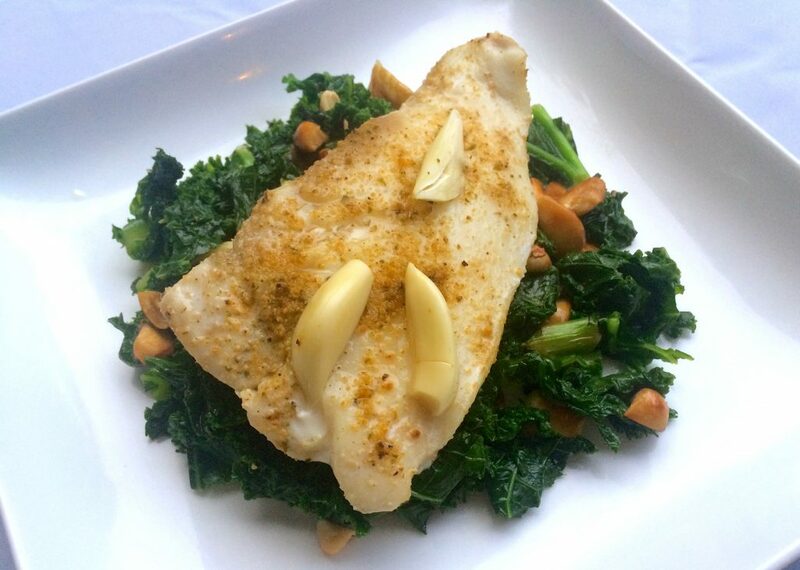 Serve over a bed of garlicky kale and cashews.